When I visited Smoky Mountain Knifeworks over the Thanksgiving holiday, one of my favorite parts of the store was the Boker booth. With a lot of production knife companies I already either handled most of their product line, or have a good feel for what their product line is like. Boker is a company I have less of a bead on. For starters, the breadth and depth of Boker’s catalog is a little intimidating. Boker is best known for making knives in Soligen, Germany, but they have their value-oriented Plus Line made in China and Taiwan, and are also making knives in Italy and the U.S.A. It’s just harder to know what you are getting into, especially when you compare this with all the other major knife manufacturers. For example, if I buy a Zero Tolerance knife, I basically know what level of quality I am going to get before the knife arrives. All of this is to say that I am less in tune with Boker’s offerings. Also, Boker’s image was tarnished by a series of poorly executed titanium framelock knives. The Boker Anso 67 was a hot design a few years ago, made popular in part by guys like TuffThumbz. The Boker collab was a chance to get a faithful reproduction of the design for not a ton of money. The problem was that the knives were fraught with lock rock. That, and some spotty fit and finish issues on other knives, shook the confidence of the online knife community. But Boker has been releasing all sorts of cool stuff over the past few years, and they have also been working on their quality control. The result includes fan favorites like the Kwaiken Flipper, home runs like the Urban Trapper, and a slew of other interesting collaborations and original designs. The Tech-Tool is another possible home run. This is Boker’s answer to the Swiss Army Knife. According to Boker, this is actually a modern reinterpretation of their original Camp Knife. When the Tech Tool first came out I wasn’t sure what to make of it. After all, Swiss Army Knives have been around for decades. It seemed rather ambitious that a company like Boker was going to come in and change the game that the Swiss have dominated for so long. But then again, Boker has been making slip joint multi-tools for almost 150 years now. Handling one of these Tech-Tools made me realize it was (once again) wrong of me to dismiss this knife. This is an interesting value proposition that deserves to be on more people’s radars. Being a multi-tool, Boker offers this knife in a wide range of configurations. Anything from a single blade slip joint, to a 4 layer, 10-tool load out. I struck a compromise and selected the “2”, which has 2 layers, 8 tools, and is similar to my Victorinox Spartan (shown in some of the pictures for comparison). This is model number 01BO812. They call my version of the knife the “Outdoor” version thanks to the olive green handle scales. The knife is also offered as a the “City” version with black G-10 scales, and there is also a carbon fiber clad version. For ease of reading I refer to my Tech-Tool 2 as simply the “Tech-Tool” at some points the review. My Tech Tool has an overall length of 6.5″, a 2.75″ blade, and it weighs 3 ounces. The Tech Tool is made in China. The Tech Tool 2 is aimed at the thicker celo-handled Swiss Army Knives (SAKs), and it compares favorably to those. It is the same length as my Spartan, and is just a hair thicker unless you include the pocket clip; in that case it’s a lot thicker. The Tech Tool also weighs a good .85 ounces more than the Spartan, thanks in part to G-10 handles, stockier tools, and a pocket clip. The Tech Tool has less tools than the Spartan, but the tools it has are thicker and more substantial. The whole knife feels heavier duty than your average SAK. The blade of the Tech Tool is also more impressive than the blade found on your standard SAK. It is thicker and wider, and shaped like a more traditional drop point hunting knife. Aesthetically it balances with the handle a little better, although it’s the same length of your standard 91mm SAK. The blade has been given a thin hollow grind and something of a mirror polish. There is very little ricasso, so you need to be careful in closing the blade. This is a slip joint, so there is no lock. There is no half stop either, and the heel of the edge can come in contact with your finger as you close the blade if you aren’t paying attention. This is a simple and functional blade shape. It’s perfect for packages and mail, for cutting up food, and for harder tasks like whittling, cutting rope, and breaking down heavy cardboard. A knife like this is great to have at a camp site, and reminds me somewhat of a Scout’s knife on steroids. The blade is wider than your standard SAK, but it’s still thin and great for tasks like cutting apples. The tip is fine and is ideal for tasks like clipping coupons and piercing through fabric and leather. Boker selected Sandvik 12C27 as the blade steel for their Tech-Tools. I have always been a fan of 12C27. It’s one of my favorite budget steels. It’s hearty, easy to sharpen, and holds a nice edge. It’s also fairly rust resistant. I am sure the mirror polish on the blade will further help with corrosion resistance. I consider 12C27 to be an improvement over the already capable steel Victorinox uses in their knives, and am glad to see it here on the Tech-Tool. My knife came sharp out of the box with a good edge. In addition to the main blade, the Tech-Tool 2 also features 2 flat head drivers, a bottle opener/cap lifter, a wire stripper, a serrated blade, a cork screw, and a carbide-tipped glass breaker. At this point I want to say that the fit and finish and general construction of all the tools is on par with what you would find on a Swiss Army Knife. Boker did an excellent job here. Victorinox has really dialed in their production after making their knives for years (and making millions of them), so I wasn’t sure what to expect with this new Tech Tool. My expectations were exceeded. The only strange thing was a little red schmutz in the screw hole for the pocket clip. This turned out to be leftover red Loctite. The cap lifter is basically a mirror image of the standard Victorinox cap lifter, only it has been made out of thicker stock. It has been mated to a nice back spring, and the tool makes a great snapping sound when you open it. It doesn’t have a true half-stop, but it comes close. The serrated blade / screw driver tool is unique to the Tech-Tool, and it’s interesting for a number of reasons. First of all it’s obviously not shaped like a standard serrated knife. Instead, the profile of the edge features has a slight concave arch. That is coupled with the blade opening to a 135 degree angle rather than 180 degrees. The end result is a unique tool ideally suited to cutting rope and fabric. It could also be used as rescue cutter of sorts, or perhaps even to open up clamshell packaging without damaging the contents with the sharp tip of the main blade. This serrated blade replaces the can opener found on most Victorinox models. I think it is an interesting choice, and is arguably more useful then a can opener. Thankfully the material in tin cans is soft, so you could still use the cap lifter and possibly this serrated edge to get a can open, although it will take a little more time. The corkscrew is something I could live without. I’m not a big wine drinker, especially on the go, so a tool like this just won’t get much use. But if you find yourself at a picnic or party with no other corkscrew you will save the day. Another gripe is that the corkscrew is also quite bulky, and sticks out a couple millimeters past the handle scale. I’d much prefer a Phillips driver here or the awl found on some SAKs. Boker includes a carbide glass breaker on every Tech-Tool. It’s an interesting addition, and combined with the serrated blade it provides the Tech-Tool with a rescue knife flair. Can’t say I have used mine on any glass yet, but “dry firing” it on some wood it appears to do a good job as a force multiplier. Although mine won’t get much use, its a nice addition and it doesn’t hurt to have it. Finally, Boker included a fold away lanyard loop. I am not a big lanyard guy so I think this is a great feature. It is there if you want to use the knife with a lanyard, but if you don’t you can fold it away so it doesn’t interfere with the ergonomics of the knife. What a nice idea. Bravo, Boker. The standard Tech-Tool comes with contoured G-10 handle scales that fit over steel liners. The handle is screwed together, and you can take this tool apart with a torx driver. As I mentioned earlier, fit and finish is excellent on this knife. The pieces all line up perfectly, there are no stray tooling marks. I think the finish is actually better than my Victorinox knives. I did start to take my Tech Tool apart out of curiosity. It comes apart with a standard T5 driver. Inside everything is put together nicely. All the parts are precision machined and fit, there are even little phosphor bronze washers on the tools. It took some fiddling to get the liner off so I decided not to completely disassemble the knife. If I decide to do this again I’ll snap some pictures. Rather than being a pill-shaped handle, the handle of the Tech-Tool has been given a more traditional shape. This offers the end user a slightly more ergonomic feel over your standard Swiss Army knife. The handle molds to your hand nicely. The smooth G-10 offers a little traction, and it’s definitely a step up over the plastic handled Victorinox models. There is no jimping, but you don’t need jimping on a slip joint like this. One of the greatest draws to the Tech-Tool is the inclusion of a pocket clip. Lets face it, enthusiasts of modern pocket knives love pocket clips. They are great for a number of reasons. The clip on the Tech-Tool is a deep-carry clip, and it has excellent spring retention. The knife buries away discretely in your pocket and is there when you need it. If you decide to use the Tech-Tool as a secondary knife, or don’t want to use the clip for whatever reason, it’s fully removable. It’s also swappable for tip up or tip down carry. Finally, a SAK with a pocket clip. It only took us until 2015. I think there is a lot to like about the Tech-Tool. First of all, it has been done really well. The build quality is easily on par with Victorinox. In some cases I think this knife is built better than a SAK. I think build quality is a big part of the charm of these little folding multi-tools, so if the quality wasn’t there that would hurt the success of this knife “bigly”. There are also some thoughtful refinements to the Tech Tool. The use of contoured G10 for the handles, a bigger blade, screw together construction vs. pins, the inclusion of a pocket clip, the glass breaker, the fold away lanyard hole, and the serrated blade. All of these refinements add up to make the Tech-Tool unique and special. A lot of this stuff adds extra weight to the knife, but I think you get something for that additional weight. I certainly don’t mind it. Many of these features are things Victorinox should have offered years ago. It’s a heartier Swiss Army knife. I like it. As far as cons to the Tech-Tool 2, I do miss the tweezers and tooth pick found on the celo-handled SAKs. Also, your Spartan does offer a couple extra tools, like the awl, and can-opener. You lose the can opener for the serrated blade, and you lose the small secondary blade on the Spartan for a bigger and thicker primary blade. I don’t think those are bad trade offs. I’m not a fan of the cork-screw and would like to see that go the way of the Dodo in favor of a Phillips driver, awl, or both. There is also the price to consider. This Tech-Tool 2 is a good $15 more expensive than a Victorinox Spartan (~$35 vs. ~$20). I think the higher price tag is easily justified by the better primary blade, the G-10 handles, pocket clip, and screw together construction, plus I doubt Boker is employing the economies of scale Victorinox does, but I realize value is subjective. If you were on the fence about the Tech-Tool, I think it’s a quality tool and it exceeded my expectations. I will always have a place for the ultra-thin, ultra-light Alox Cadet, but this gives the plastic handled SAKs a serious run for their money. I also think it’s better executed than the Spyderco ClipIt Tool. Check out the Tech Tool if you want an upgraded Swiss Army style knife. I am glad I picked one up. I recommend purchasing the Boker Tech Tool at Amazon and BladeHQ. Please consider that purchasing anything through any of the links on this website helps support BladeReviews.com, and keeps the site going. As always, any and all support is greatly appreciated. Thank you very much. A very good review, thank you. The recent reputation for poor quality control has kept that manufacturer from serious consideration. Glad that the problem has been addressed. The lack of scissors keeps this Boker model and the Victorinox fSpartan rom consideration. For an urban guy, I like a multitool/multifunction knife with a small scissors . As always, thanks for taking the time out to check out the review. I know some guys are big on scissors for their SAKs and small multi-tools. You may want to check out the Tech-Tool 3. That configuration features scissors and an awl, but that is a 3 layer configuration, rather than a 2 layer. So it will be thicker and heavier. Great analysis of the product, as usual. Looks like a great beefy solid SAK alternative. For that price, I will consider it if they replace the corkscrew with other more day to day functional tool. Thank you, JouWen! I totally agree. The corkscrew needs to go. Thanks for the great review. I completely agree with your opening comments on Boker. They are a bit of an enigma to me. My grandfather used to carry a small Boker pocketknife, but beyond that, I don’t know very much about the company and don’t hear very much about it on the forums that I frequent. This is an interesting knife though. I love Swiss Army Knives, and the fact that they nailed the fit and finish makes this a knife that I’ll have to check out. Boker doesn’t appear to get as much publicity here in the States, but they make some cool stuff. The Tech-Tool is an excellent example of this. They also have some of the best collaborations in the industry. I look forward to reviewing some more of their knives in 2017. If you are a Swiss Army Knife fan then I think you will like this Tech Tool. They tastefully brought the classic plastic-handled SAK into the 21st century. I hope it sells well for them and they are able to further flesh out the product line. Yeah, this is a useful, good quality line of EDC multitools. Thanks for the review. I agree that the corkscrew is kind of a specialty tool these days. But in this case I’d argue it fits the theme of the multitool. See that funny little curved serrated blade thing that the TT2 has in place of a can opener? What could it be. OK, yeah, there’s a little driver on the end, but it’s still kind of a puzzling shaped tool … until you realize that it’s really a foil capsule cutter for wine bottles! You know, the little curved thing that folds out of the standard “sommelier knife” bottle opener that we’ve all seen at bars and restaurants, and many have at home. I’ve often used the TT2 to open wine and the little blade works perfectly in this role. 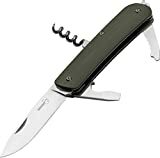 I checked: even on Boker’s website in the original German they just sheepishly call this a serrated blade, but c’mon, it is totally a capsule cutter for wine bottles, and on an MT with a corkscrew I have to assume that’s the real intention. So the TT2 is a dedicated picnicker’s multitool – nice generalist food blade, corkscrew, capsule cutter, and bottlecap lifter. It’s a “sommelier knife” that has a pocket clip and a genuine knife! I think that’s a fun, coherent theme. Only thing I’d add to it would be an “assist” lever for the corkscrew, like you see on dedicated wine openers. The Leatherman Juice C2 (let’s all imagine the good-looking, all steel pre-2014 Juices, back when Leatherman still took that MT line seriously) has a cap lifter that cleverly doubles as an assist for the corkscrew. It does help. BTW don’t bother with any of the Tech-Tools that have more than 2 layers. Too thick in the pocket. Unfortunately that makes it hard to get one with a Phillips driver. Anyway, nice read! I hope that the Tech-Tools finally spur Victorinox to start making some SAKs with pocket clips! Nitpicky self-correction: the pre-2014 Juices weren’t all steel, but they had the same construction on both handles of the MT: nice colorful anodized aluminum over steel frame. The current Juices have a bare stainless handle on one side and kinda thin anodized aluminum on the other. It looks so chintzy. Can’t really think of any reason for the change but lowered production costs. The 2014 redesign also nerfed the length of the Juice knife blade, which wasn’t great to begin with. Basically, the whole line seems like a waste of time now. I wonder how long it will stay. But the original red-handled Juice C2 was a cheery little picnic MT, and IMO it makes a relevant comparison to the TT2 reviewed here. A sommelier’s knife! Interesting! That makes perfect sense now that you mention it. Thank you. I’d like to see them offer a version that diverges a little further from the beaten path. Swapping out that corkscrew for a Phillips driver, and perhaps shoe horning in a pair of scissors. That would be nice! I have a larger Tech Tool that includes the scissors and Phillips driver. They are good, but the scissors take up a whole layer and I do find them a bit too long and thin for best use. (I would make the same criticism of the LM Juice scissors.) When it comes to scissors on multitools, my preference is for the “small but strong”, higher-control scissors found on the LM Charge and Wave. Last thought: avoid the carbon fiber versions of the Tech Tools. It’s a particularly cheap looking, mirror-slick textureless peel ply carbon fiber. Bleah. Stick with the comfy black or green G10 scales on the normal versions. Great review. I got me the one-layer, urban model a few days ago while visiting London. It has a blade. Period. (Unless you consider, like Boker, that the glass breaker and the pocket clip are tools, rather than features). But it is a very nice blade and as said compares favorably to that of a SAK. I am partial to the SAK Soldier, which is strong and light, simple and serviceable, and is what I’ve carried in my pocket most days for ten years. The Tech-Tool One is lighter, and has the clip (which I moved the tip up position I prefer). And it looks classy. 007-like if you will. The one change I would make to the knife is that I’d make it a lockback. I mean, why not? And yes, that serrated blade on the TT2 is a capsule cutter. Thank you for the kind words. I like how the single layer Tech Tool as well. Looks clean and functional. A great little pen knife. I am glad you have been enjoying yours. I agree that a lockback version would be a nice option. I hope you enjoy your Tech Tool.